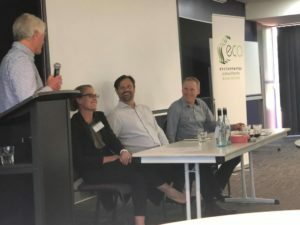 More than 40 people attended this one-day event held on the 7th November at Bentley Technology Park Function Centre, which aimed to explore mega trends in environmental consulting and how, as environmental consultants, we can future proof our jobs, careers and businesses. The President of the ECA Jason Hick officially opened the event and the day’s proceedings were emceed by Shaun Grein, Managing Director at ecologia. The keynote speaker the event, London-based ERM CEO Keryn James, kicked off Session 1 with her very informative outlook for the environmental consulting sector over the next five years from global, national and local perspectives, including growth trends and emerging opportunities. Golder Associates Principal Mine Closure Specialist Darren Murphy finished Session 1 with a thought provoking take on the Generalist versus Specialist in environmental consulting question. Session 2 discussed local market recruitment accreditation and insurances and began with leading environmental sector recruiter Ben Oakley from Hunter Executive Search Consultants providing a very informative overview of the current environmental market along with strategies for consultants and employers to future proof their careers and businesses. This was followed by a concise overview of the Biodiversity Conservation Act 2016 by Herbert Smith Freehills Special Counsel Michael Voros, including some of the key risks and opportunities for environmental consultants associated with the Act and its regulations. The third presenter for the Session 2 was DWER Acting Director of Regulatory Capability, Germaine Larcombe, who gave us a summary of some of the key drivers and the potential benefits of accreditation to environmental consultants. Session 2 was concluded by Darren Pavic from Bovill Risk and Insurance Consultants who identified some of the main contractual risks and appropriate professional indemnity insurance cover requirements for consulting businesses. Session 3 began with former Office of the Environmental Protection Authority General Manager Kim Taylor forward looking at state and Commonwealth environmental approvals processes and the role that consultants can play in guiding a balanced risk-based approval to approvals. 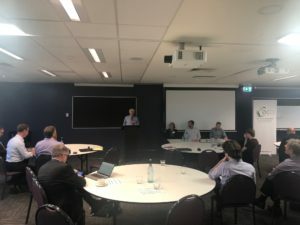 WABSI Information Management node program director Chris Gentle wrapped up the Session with an informative presentation on how having robust and reliable datasets will help better understand biodiversity condition and improve the veracity of environmental impact assessments. The day’s proceedings concluded with a panel discussion session three experienced environmental practitioners, BHP Billiton Head of Environment Iron Ore’s Gavin Price, AECOM’ Group Lead, Environment, Jamie Shaw and 360 Environmental Director Michelle Rhodes and their experiences in guiding large projects in WA with complex environmental and political issues, including BHP’s Pilbara Expansion Strategic Proposal, MRWA’s Roe 8 Extension and Water Corporation’s Desalination Plant Projects, through state and Commonwealth environmental approvals processes.